A car is trapped on a collapsed section of the offramp of Minnesota Drive in Anchorage, Friday, Nov. 30, 2018. A magnitude 7.0 earthquake struck around 8:29 a.m. local time followed by ensuing, smaller earthquakes. Citing United States Geological Survey research geophysicist Gavin Hayes, CNN reported Saturday that “a magnitude-5.2 aftershock about 11 p.m. Friday was the second-biggest event since a magnitude-5.7 temblor hit minutes after the main quake.” Despite earthquakes being common in the area, Friday’s event was still significant. Videos shared on social media captured widespread damage across Anchorage and the surrounding area. One video shared by Brettschneider on Twitter captured drone footage of cracks in ice at Anchorage’s Waldron Lake. According to Brettschneider, the ice was 8 inches thick. 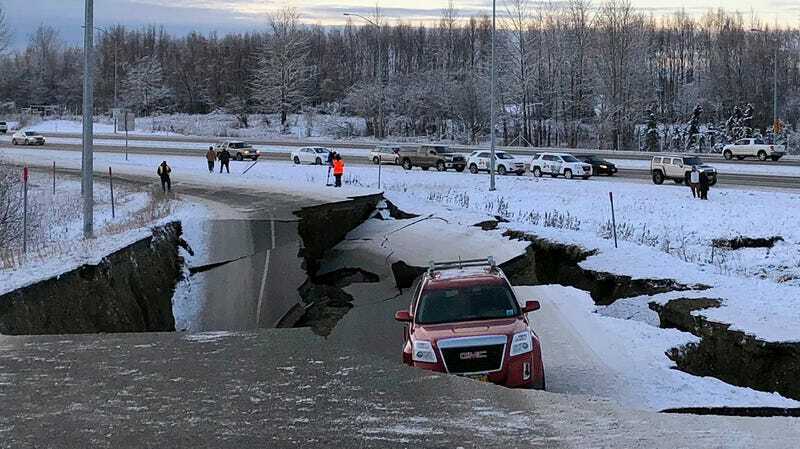 At least two highways were closed down following the earthquake, with local CBS affiliate KTVA reporting that area’s Glenn Highway endured significant damage that included a “massive sinkhole.” Power losses also reportedly affected tens of thousands of people following the initial earthquake. Governor Walker said in a phone interview Friday that there’s a possibility that some infrastructure damage could take weeks or months to repair, especially given the winter season. Walker also said he spoke with President Donald Trump, after which call KTVA reported the Federal Emergency Management Agency approved assistance for the area. According to Alaska Public Media, schools in the area are expected to be closed until at least Wednesday of next week.